Much of the work I do is focused on helping clients manage their space and belongings in a more efficient way. However, personal organization, including time management, can be just as important. One thing we as aspiring organized people forget to lump into the time management category is actually getting places on time. In fact, this can be one of the greatest organizational challenges people face on a daily basis. 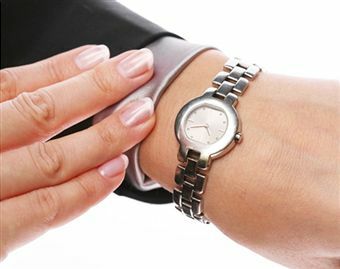 I myself struggle with being punctual now and then, but I do believe it is extremely important to put your efforts towards arriving to events, appointments, and outings with friends on time. It gives the right impression to colleagues, clients, and pals that you respect their time and take them and yourself seriously. For your children, modeling punctuality instills a healthy respect for structure and routine, thus setting them up for success in the future. Easier said than done, I know. Sometimes, the odds of public transportation, traffic or your never-ending to-do list simply keep you from making the punctuality grade. And that is okay now and then, as I said before. Things happen! However, there are a few tricks we can each use in our day-to-day lives to increase our on-time factor and decrease the self-created factors the keep us from getting where we need to be. The most helpful advice I can give is to work backward. This is a tip I’ve recommended before in previous posts. Think about when you need to arrive to pick up your children or to meet your girlfriends for evening drinks. From there, allocate your time based on one-two hour increments backward from the time you need to LEAVE to get there, RATHER than the time you need to BE THERE. For example: To meet your girlfriends across town by 6:30pm, you should leave your house by 5:45. Give yourself one hour to get dressed and touch up your makeup and hair, starting at 4:45. If your day starts at 7:45, that gives you 9 hours to take care of your work, chores, etc. Your half-way point is 12:30pm. Also, don’t forget to build in a few breaks for lunch, personal tasks, and brief moments of me-time. If you are a person on the go, use the alarm function on your phone to signal the end of one of your 2 hour time increments. When the alarm sounds, move on to the next task – unless you are on a roll of course! If you’re a person who sits in front of the computer all day, use your calendar as a to-do list, so that you are always aware of the time you’ve given yourself to complete necessary tasks. Build travel time (and potential traffic delays) into that plan to set yourself up for successfully arriving to your desination on time. As you can see, I believe that managing the time in your day will help you to view getting places on time as another ‘to-do’, rather than optional. By adopting a few of these suggestions, you too can work towards the goal of getting there on time. You’ll be surprised at how gratifying it feels to arrive at the right time and your friends, family and colleagues will appreciate it too.